When I go to Paris I always visit the pastry shops with the best macarons; and with macarons in all kinds of flavors. 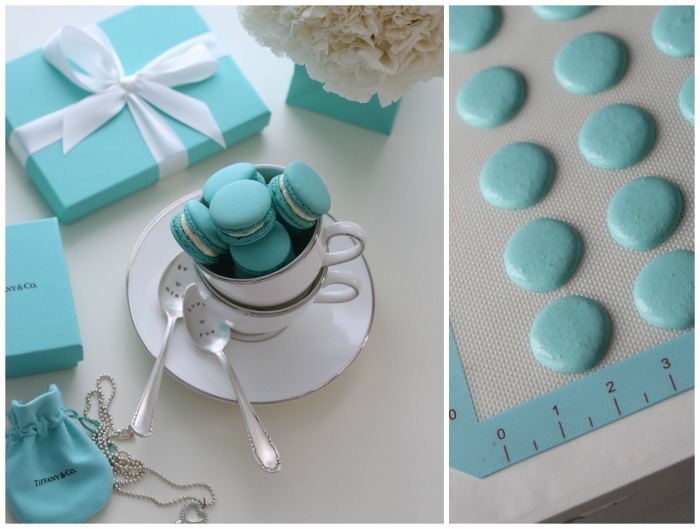 Today I’ll share the recipe for Tiffany macarons. These delicious little treats are perfect on any desserts table. And now that spring / summer is getting closer – why not throw a party? 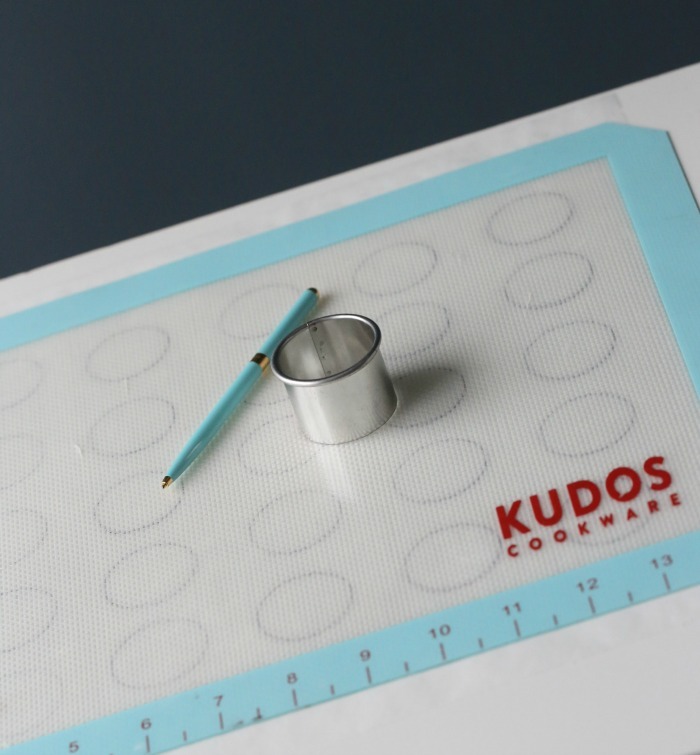 Line 3 baking sheets with silicone baking mats or parchment paper. If you do not have three baking sheets, use what you have available and bake your macarons in batches. Using a 1.5 inch circle cutter as a guide, draw four rows of five circles, evenly spaced, on parchment paper. Turn paper over and place underneath the silicone baking mats or parchment paper on the sheet pans. 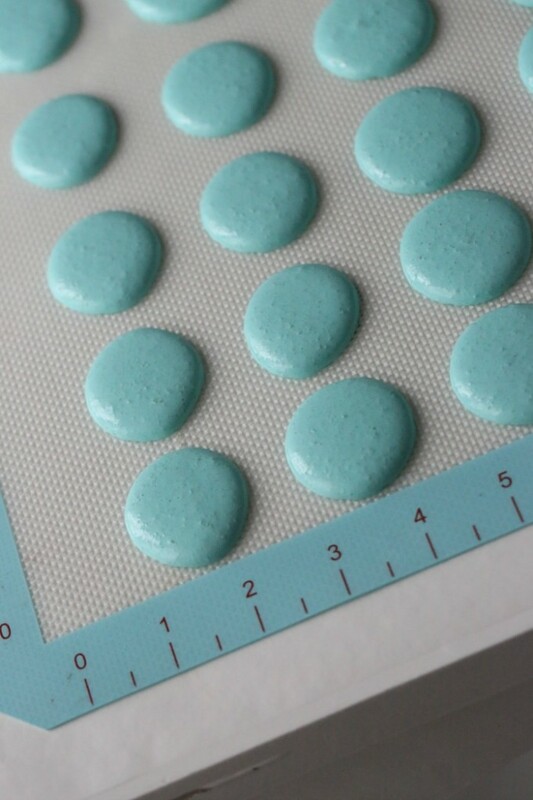 You now have a guide to help you pipe evenly sized macarons. Prepare a piping bag with a 3/8” (10mm) plain round tip such as an Ateco #804. Place 2 1/3 oz. 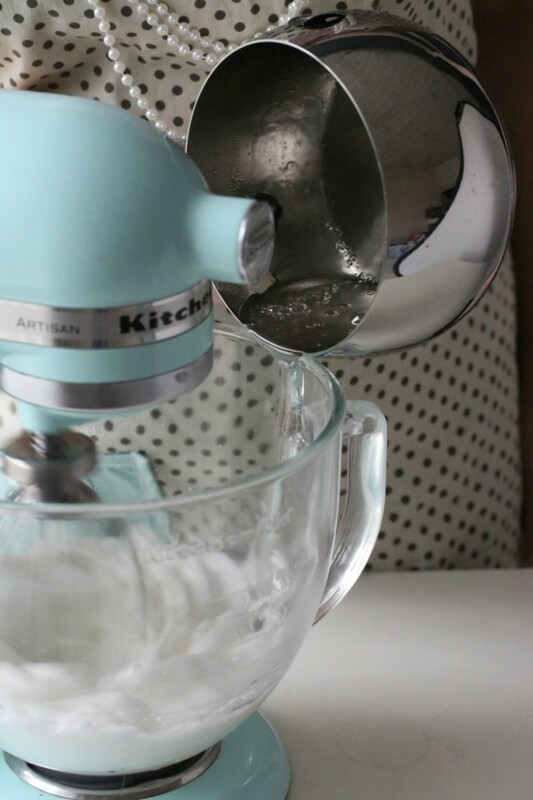 (65 g) egg whites in the bowl of a stand mixer and attach wire whisk. In a small saucepan on medium heat, bring the sugar and water to a boil, stirring gently. When mixture starts to boil, remove spoon and place thermometer in pan. When the temperature of the sugar reaches 236F (113C), start whisking the egg whites on high speed. When the sugar syrup reaches 240F (115C) and the egg whites are frothy, remove from heat and slowly pour the syrup down the side of the bowl into the egg whites while still whisking. Avoid pouring syrup directly onto the whisk. 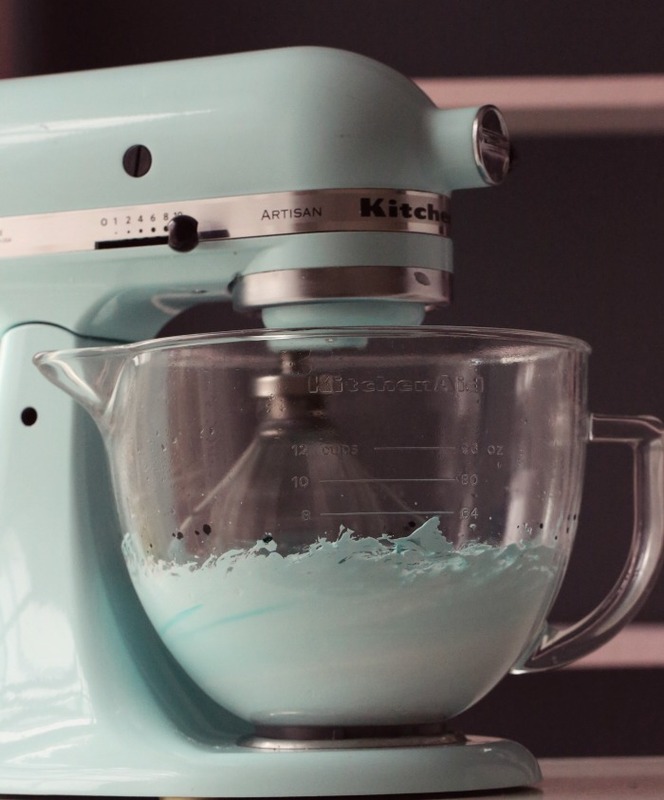 Continue whisking the meringue for 8-10 minutes until the bowl is cool to the touch. 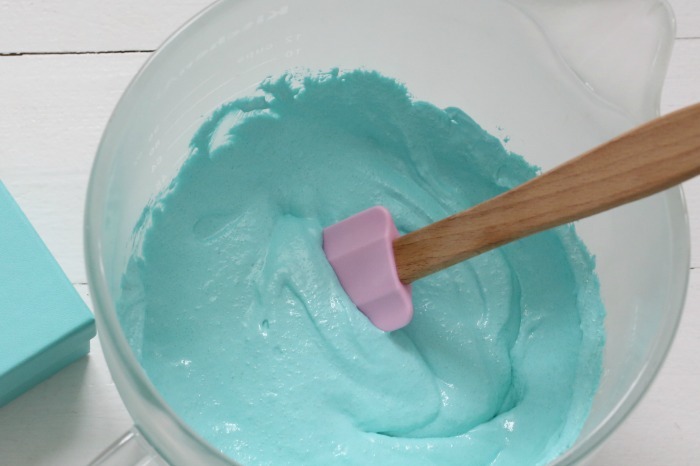 Add food coloring during the last part of the whisking process. Here I’ve used turquoise from Americolor. 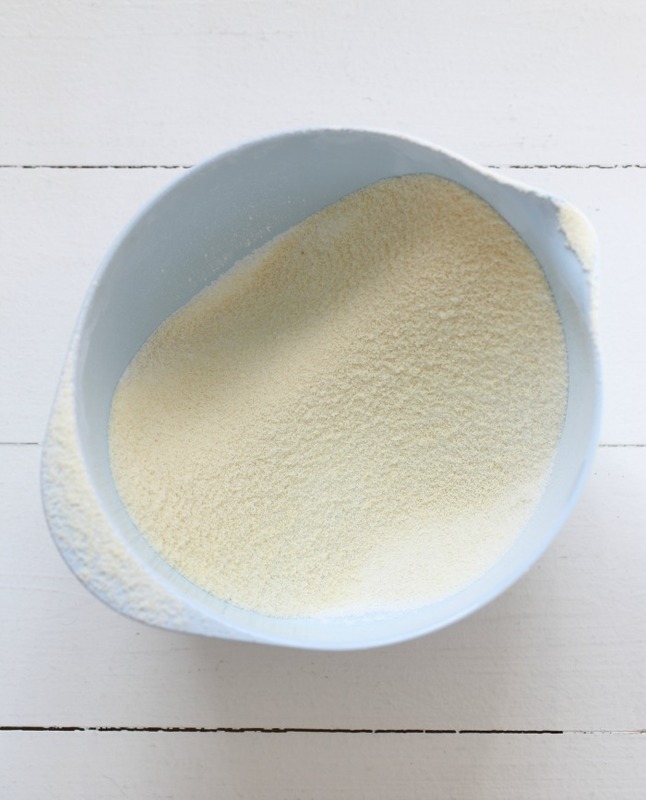 Meanwhile, place the powdered sugar and almond flour in a medium sized bowl. Mix to combine and add 2 1/3 oz. (65 g) egg whites. Stir until a thick paste. Fold the almond mixture into the cooled meringue. 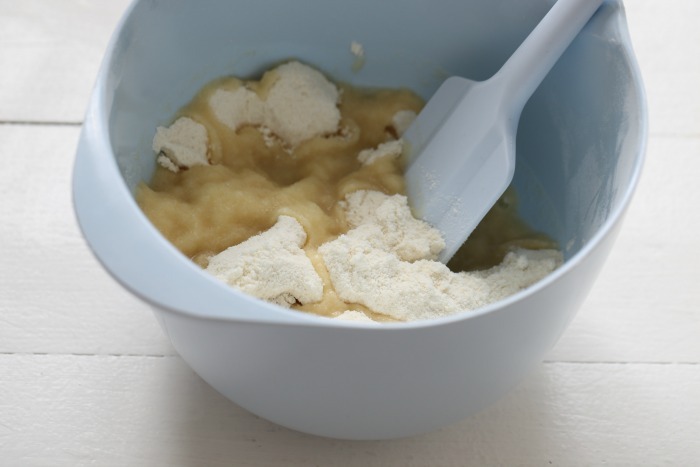 Check consistency of the mixture often to avoid overmixing. Transfer mixture to a piping bag and pipe out circles of batter onto the prepared parchment. Any leftover batter can remain in the bag while the first macarons are baking. Bake for about 12 minutes. I use the fan setting here. 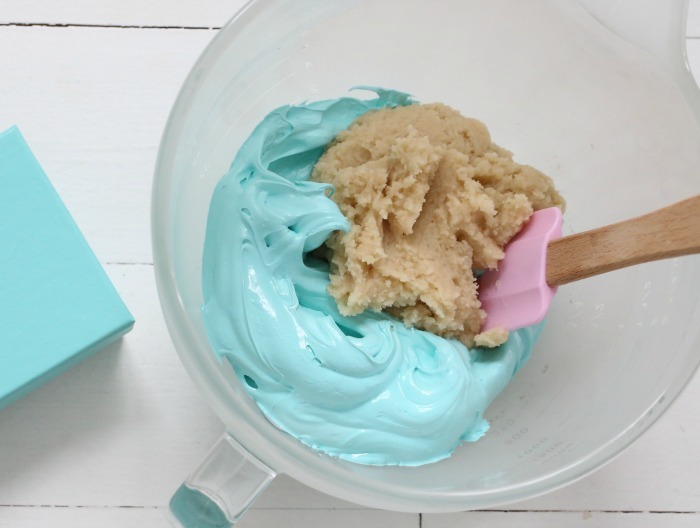 No need to leave them to dry before baking, like some recipes for macarons require. 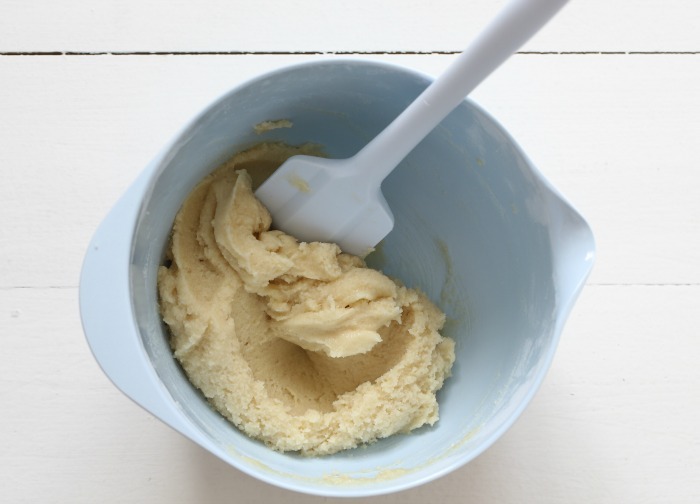 Place chopped white chocolate in a microwaveable bowl. Add cream. Heat on high for 1 minute. Stir to combine. Heat for another 15 seconds more to melt all the chocolate, if needed. Repeat if necessary, but avoid overheating the ganache. Allow to cool for about 1 hour before filling cookies. Mixture continues to firm as it sits. If necessary, reheat mixture in microwave for 10 seconds to soften. Can be stored refrigerated for up to 1 month. 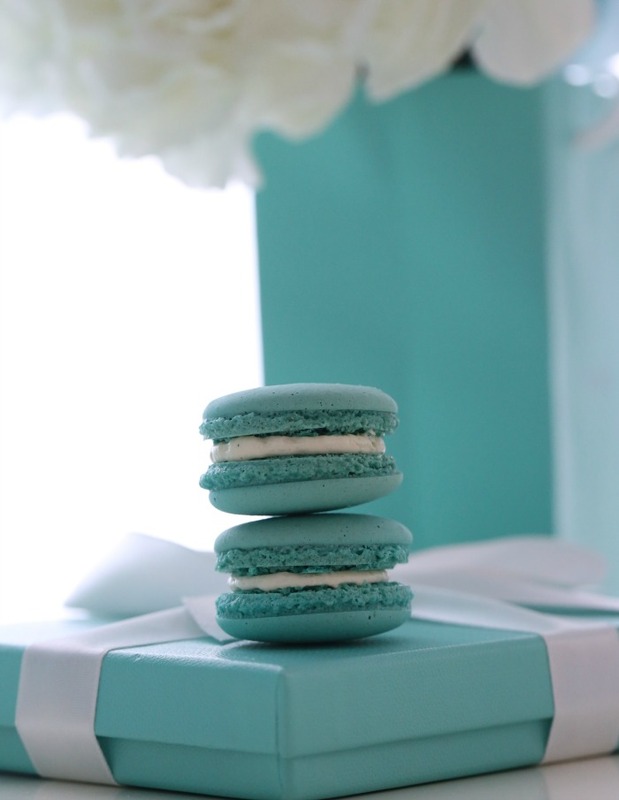 Hope you got inspired to make these macarons. 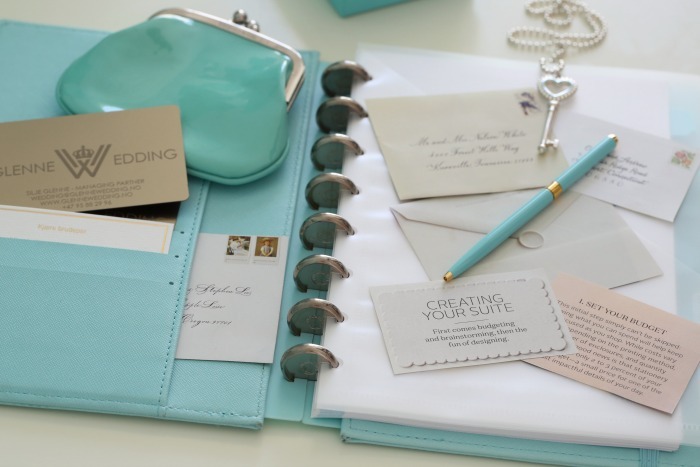 Maybe you would like a Tiffany theme for your wedding? 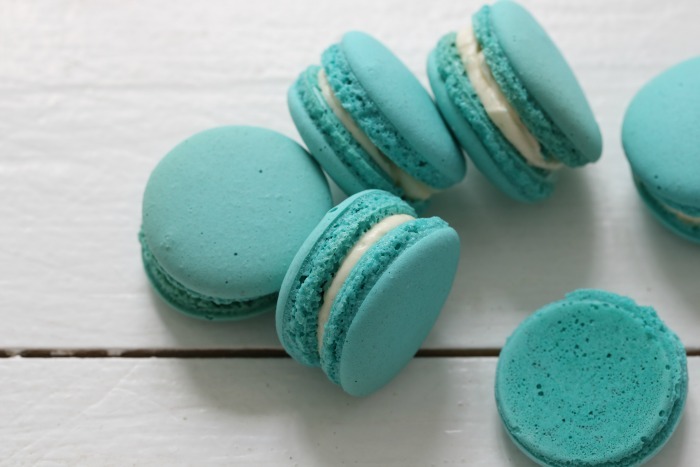 If so, these macarons will be perfect for the desserts table! I’m from Australia . You said you bake the macarons for 12 minutes on fan force . How long would you bake them for if there is no fan force on the oven ? And does the temperature 135 degrees of the oven stay the same if I don’t use a fan ? They look perfect! Can’t wait to try them out! 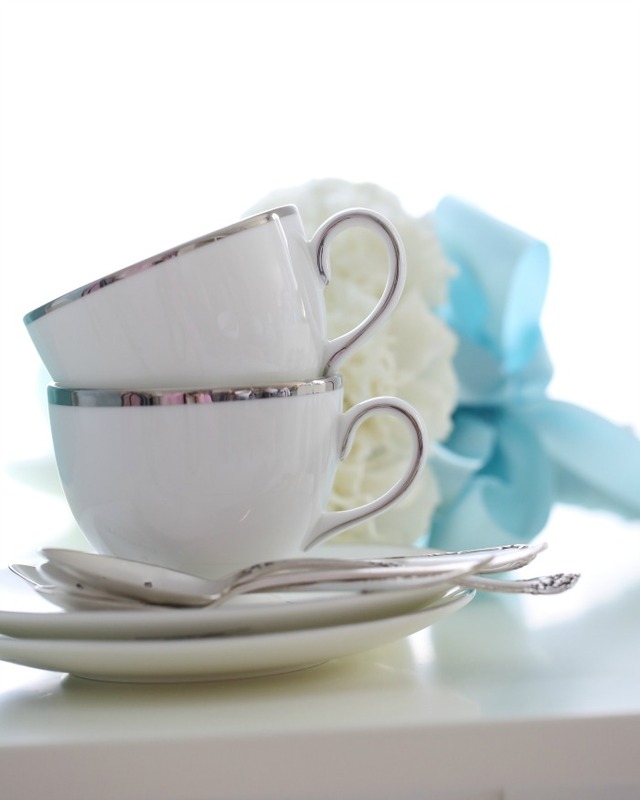 I love your blog and thank you for sharing this recipe! Why do you say that the macarons don’t need to be left out to dry before baking? Is it because the baking temperature is so low? I’m Mahrokh from England. Would you please let me know why you didn’t tap your tray to leave the extra air from macarons before cooking. I always thought that’s the necessary steps not to avoid. Thanks. Thank you for this, tou have just remived my fear. Can this mixture be halved if I need to make a few? 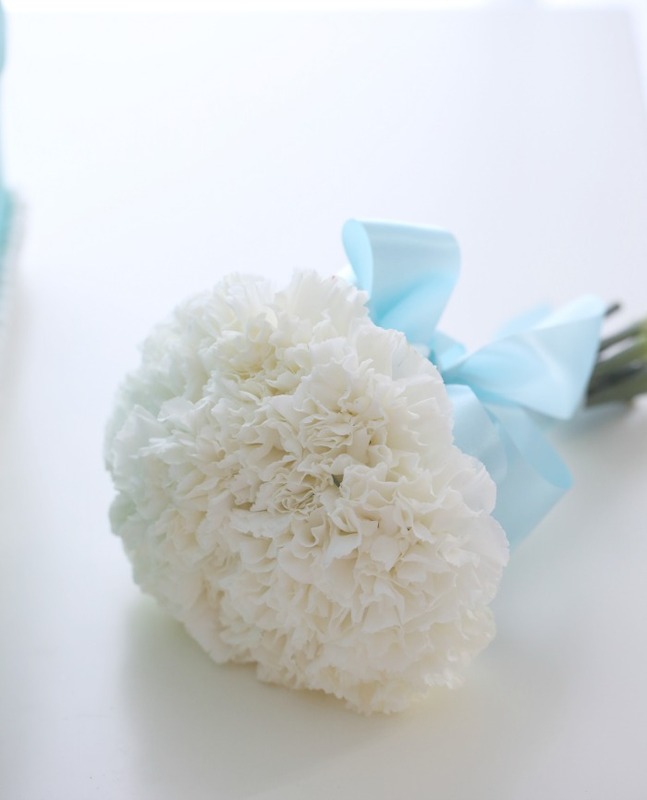 Hi Glenz, now why do you want to make halv only, don’t you love macarons : ) kidding yes you can of course. What brand of food colour did you use to achieve this colour? Blue pluss a littebit black food colour!